Tubinox Starflex is a double skin, smooth bore stainless steel flexible multi-fuel flue liner designed for use with all solid fuel, wood, coal, gas, oil and pellet heating appliances. This range is perfect for the renovation of existing masonry chimneys with offsets. It is ideally suited for operating temperature up to 450°C and comes with a 10 year Axa backed guarantee. In grade 316L (Starflex 2012) or 904L (Starflex HR 2010) our Tubinox Starflex is extremely robust and strong to minimise problems on site whilst passing it down an existing masonry chimney. It can be supplied in 3 different packaging methods: Cut lengths, Ecofilm coils and de-coiling box. All of the products offered by Cheminées Poujoulat have been rigorously tested in every configuration by the CERIC Laboratory to ensure they meet highest standards (Building Regulation Document J – Amendements to Approved Documents). Cut Lengths: It can be ordered in 8,10,13 & 16 metres, it is wrapped in bubble wrap and shrink wrap eco-film to ensure maximum protection during transportation. Cut Lengths Totems: 3 to 4 cut lengths mounted on a «totem» pallet for easy storage. Ecofilm Coils: From 44 to 31 metres coils depending flex diameter, it can be packed as 1 coil shrink wrapped on one pallet or be supplied with 2 coils on one pallet. De-coiling Box: Perfect for vans, you can pull out and cut off the length required without un-wrapping the complete coil. The existing masonry chimney itself isn’t very well adapted for the evacuation of combustion gases coming from your heating appliance. Indeed, the existing stack can be too old, too large and its tightness can’t be guaranteed. Your actual installation may cause a risk of domestic fires, condensation or bad chimney draught. 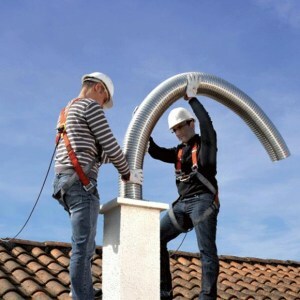 It is essential, to get the best of your system chimney, using the right flexible liner, adapted, conformed and safe. You then require lining your existing masonry chimney. The lining principle consists of introducing inside your existing stack, a stainless steel flexible liner adapted to the evacuation combustion gases.